Today ODM has the pleasure to talk about an exclusive Custom Bottle Holder. We recently have had the chance to try this universal holder and would like to share this promo product with you. The main idea behind the item was to develop a versatile drink holder. A holder that could have been used anywhere and for different objects. It happens sometimes, to have so many thing in the hands or to be very annoyed to carrying things around. And most of the time to be able to comfortably go around you need to have holder for everything, phone, bottle, glass holder and so on. Here it is an universal holder instead. The main product can be made of many materials including fabric, PU, and real leather, which is finely stitched around a wire frame structure. This construction permits it to be adjustable and deformable. It can be shaped without ruining the structure and reshaped to the original form. Also it is possible to tighten or widen the arms of the holder by simply putting some pressure. 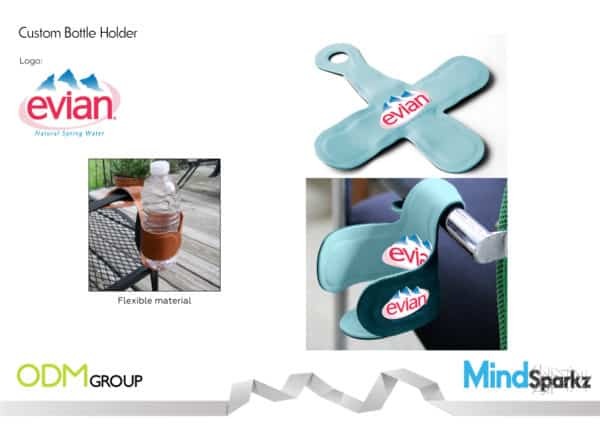 Another cheaper alternative is the custom bottle holder offered in EVA foam, same properties plus insolating feature. Always adjustable, this model is softer but also very resistant. Once opened, it has a flat cross shape with a hanger hole at the end of the longer flap, while the centre represents the core area of stability. It is easy to carry, easy to shape and has a large area for branding. When needed you just have to fold the three flaps in a cup form and wrap the hanger arm around the chair or use the hole to hang it somewhere. The two sides of the universal holder come in two different colours to differentiate between inner and outer side. Why do we like this custom bottle holder? 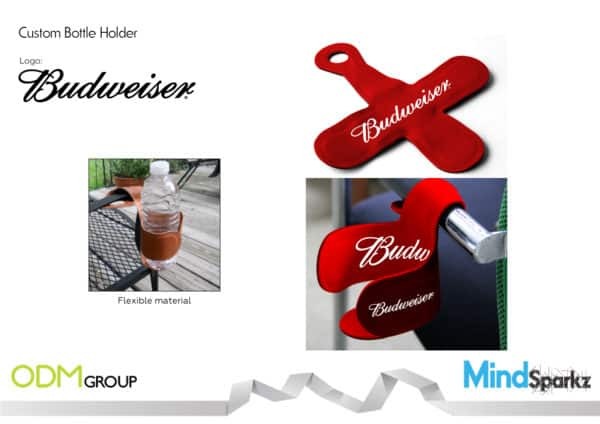 Customisable: Marketing is about making your brand known and this custom bottle holder has an ideal area to be branded with your custom logo. It could be applied different priniting tecniques and the item could be personalized with colours and designs matching your team or company. Adjustable: The promo holder is versatile thanks to its feature to adapt to different objects. Some examples could be not only cans and bottles, but also snacks, phone, glasses, tools and so on. Also the longest flap of the custom bottle holder secures your item by bending or hanging to different surfaces. Exclusive: The object in question is an invention, which means nobody have produced it till now. It is trully an unique item that could help to boost your brand awareness and value. People will bring it with them everywhere, to hold their drink while watching a match, the bottle at a festival, as a stand for the phone, or anything else of a similar measure. We will provide you with our quality sourcing, designing and manufacturing services necessary to help you in your next promotional campaign.